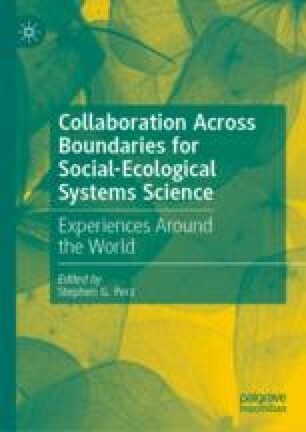 This chapter introduces the challenge of collaboration across boundaries for social-ecological systems (SES) science. Management of SESs for sustainability and resilience amounts to a wicked problem that requires cross-boundary collaborative approaches. It is far less appreciated how to pursue such approaches effectively, since the basic sciences in which technical training for the study and management of SESs differ from the applied behavioral sciences to support collaboration across boundaries. The chapter reviews a framework for understanding the issues, tasks, challenges, and strategic practices involved in collaboration. A discussion of boundaries and their crossing follows, noting how spanning disciplinary, organizational, and national divides complicates collaboration. The chapter concludes with an outline of the book, which draws on experiences from collaborative projects that crossed multiple boundaries in the pursuit of SES science around the world. Berdej, S. M., & Armitage, D. R. (2016). Bridging Organizations Drive Effective Governance Outcomes for Conservation of Indonesia’s Martine Systems. PLoS ONE, 11(1), 1–25. e0147142. https://doi.org/10.1371/journal.pone.0147142. Edmunds, D., & Wollenberg, E. (2002). Disadvantaged Groups in Multistakeholder Negotiations. CIFOR Program Report. Retrieved June 30, 2007, from http://www.cifor.org/publications/pdf_files/Strategic_Negotiation_report.pdf. Liu, J., Hull, V., Luo, J., Yang, W., Liu, W., Viña, A., et al. (2015). Multiple Telecouplings and Their Complex Interrelationships. Ecology and Society, 20(3), article 44. http://dx.doi.org/10.5751/ES-07868-200344. National Science Foundation (NSF). (2018, March). Dynamics of Coupled Natural and Human Systems Program. Available at https://www.nsf.gov/funding/pgm_summ.jsp?pims_id=13681. Ruiz-Mallén, I., & Corbera, E. (2013). Community-Based Conservation and Traditional Ecological Knowledge: Implications for Social-Ecological Resilience. Ecology and Society, 18(4), article 12. https://doi.org/10.5751/es-05867-180412.